There is considerable variation in children’s language development and how children use language to learn and communicate with others. We want to understand why these variations occur, and how language skills are related to school and social success over time. To do this, we sampled the language and communication skills of a large and diverse group of children. We then traced the language development of some of these children in more detail and over a longer period of time. We hope this information will tell us how many children starting school need extra help with language, and what factors make it easier for some children to develop talking and listening skills than others. How many children in the UK start school with significant and persistent language learning needs? If a child starts school with delayed language development, what (if any) additional developmental concerns are present? How do patterns of language and co-occurring difficulty change over time? Which patterns of language and associated developmental concerns have the greatest impact on academic achievement and/or social well-being? The screening phase of SCALES took place in the summer term of 2011/2012. All mainstream primary schools in Surrey were invited to take part. Teachers were asked to complete an online questionnaire about the behaviour, language and communication skills, and academic progress of each child in their reception class. Over 280 reception class teachers from 150 schools across Surrey provided anonymous information about every child in their class. Our on-line questionnaire asked teachers to report everyday language skills (i.e. clarity of speech, range of vocabulary, complexity of sentence grammar, ability to tell stories, understanding of jokes and figurative language). 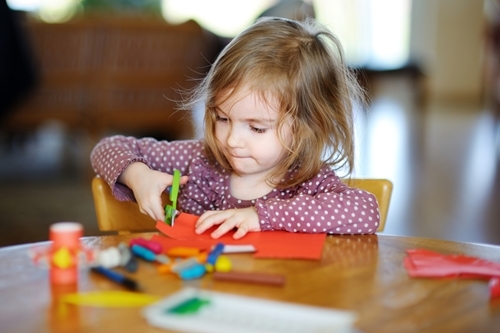 We also asked about the child’s social, emotional and behavioural development, and asked teachers to complete the new Early Years Foundation Stage Profile, which assesses key areas of learning and development in the early years. The questionnaire was completed for 7,267 children! These data indicated that the youngest children in the class were more likely to be rated by teachers as having poorer language skills, more behaviour difficulties, and were less likely to achieve curriculum targets at the end of their first year in school. The best overall predictor of academic success was language competence. Our findings suggest a mismatch between the language abilities of most 4-year-olds and the language demands of the early years curriculum. We have suggested here and here that starting school at 4 is fine, as long as there is a strong focus on developing oral language skills. What happened in SCALES 1? From the screened population of 7267 children, we selected 590 children for in-depth assessment of language, social, and cognitive skills. These children represent the full range of language and communication abilities. They were seen by a member of the SCALES research team at two time points: once in Year 1 (Sept 2012-July 2013) when they were 5-6 years old and 95% were seen again in Year 3 (Sept 2014-July 2015), when they were 7-8 years. The research assessment took place at the child’s school and was conducted by a trained member of our research team. Teachers and parents were asked to complete a few questionnaires about the child’s language and behaviour skills. 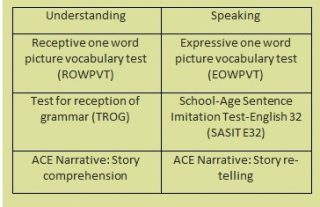 How have we assessed language skills? Our cut-off for developmental language disorder of unknown origin was -1.5SD (~7th centile) on two of the five language composite scores in the context of non-verbal ability scores of 70 or more. Normative data from our language battery will soon be available on the SCALES website. This will enable practitioners and other research teams who are using the same language battery to calculate age standardized language scores by entering the child’s age and raw score.